Geography/Culture: Greek: especially Titane. Devotion to Her was introduced to Athens in 420 BC. Linguistic Note: related English words: hygiene, hygenic etc. Description: Originally: Radiant Goddess of healing powers and medicine. Later also: Preserver of humanity from sickness; Protectress of humanity from all dangers on land and sea. And look here for more. Iconography: often depicted as a maiden of benevolent appearance, wearing the chiton and giving food or drink to a snake out of a dish [probably a patera, meaning making a libation]. To Whom Sacred: the all-heal mistletoe (loranthus and ixias); snake. Title of Athene, Who existed in Athens before the introduction of Hygeia, as a separate Goddess, with Whom Her healing attributes became identified. Sister to: Panacaea, Healer, below. Among the Romans She was identified with Salus, below. The Romans translated Her name as: Valetudo, [Health-Bringer], and identified Her with Salus. Sources: EB/Hygeia; GMv1/175; GMv2/index; NLEM/170. Male Associates: consort, Asclepius, god of healing; sons, Machaon, mortal king and surgeon, Podalirius, mortal king and surgeon, and Janiscus. Perhaps Mother of Aigle, (linked with Hesperides), Who is sometimes said to be the Daughter of Asclepius. Description: Goddess of purification and healing. Source: Encyc Brit v2 664a. Linguistic Note: Roman orthography from Greek panakeia, itself from panakes, 'All healing': pan, 'all', plus akos, 'cure'. Related English word: panacea. .
Geography/Culture: Italy: Old Italic. A temple on the Qurinal was eracted to Her in 302 B.C. Linguistic Note: from Latin stem salut-, 'health',' whole, uninjured'. Related English words: safe, salubrious, salutary, salute. To Whom Sacred: ears of grain (Her older attribute). 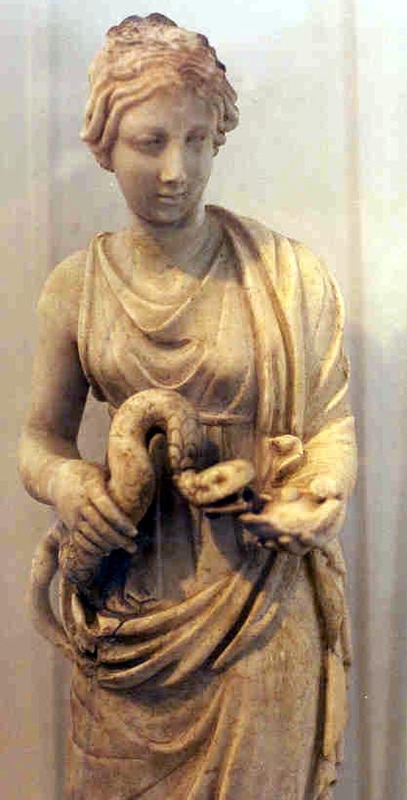 Iconography: She is often depicted with Hygeia's snake and bowl. Festival: March 30, when prayers were offered to Her. She was also appealed to in times of great sickness. Perhaps Cloacina, could be considered an aspect of Her. She forms a triad with Concordia and Pax, qv Concordia. The Romans identified Her with Greek Hygeia, Health. She bore the sur-name of Publica -- Salus-Publica, [She-Who-Cares-for-Public-Health]. The translation of Hygeia's name into Latin Valetudo, V1L]TWDO, [Health-Bringer], may have served as a title for Salus. Source: WWGRM/165, 208; FWSDMFL/968; GRARE/8. worked on: May 1996; May 1995; August 6, 1991.